A delightful room with a genuine, old fashion clawfoot tub. Ideal for a warm soak in a cold winter's night. Followed up by a gourmet breakfast the next morning and an interesting, engaging chat with the owner. Definitely in our list of great finds for 2019. Where to find Kouchibouguac hotels near an airport? 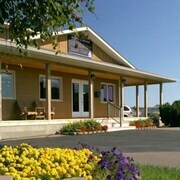 Where can I find hotels in Kouchibouguac that are near tourist attractions? Kouchibouguac only has one Expedia-registered accommodation option so, if you plan to stay nearby be sure to make your reservations early. 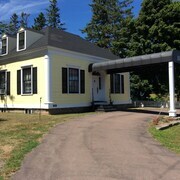 If you would like like to stay within a short drive from the middle of Kouchibouguac, the Kouchibouguac Resort could be an excellent destination. 19 kilometres (12 miles) away from the middle of Kouchibouguac, is the Les Chalets du Havre. 85 kilometres (51 miles) to the south of Kouchibouguac you'll find Moncton, where you can spend the day visiting University of Moncton and Magnetic Hill Zoo. The St. James Gate and Residence Inn by Marriott Moncton are just some of the fabulous Expedia-listed short and long-stay alternatives in Moncton. 75 kilometres (47 miles) to the southeast of Kouchibouguac, is Shediac, which is home to the Seely's Motel and L'Auberge Gabrièle Inn. The Parlee Beach Provincial Park and South Cove Camping and Golf are a couple of the more popular sites to check out when visiting Shediac. If watching sport is what you love, be sure to visit Moncton Coliseum, which is 80 kilometres (50 miles) to the south of Kouchibouguac. 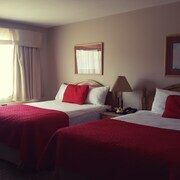 If you are keen on booking a room close by, make a reservation in the Hampton Inn & Suites by Hilton Moncton or Four Points by Sheraton Moncton. Greater Moncton International Airport is a practical airport, and is located 80 kilometres (51 miles) away from Kouchibouguac. Accommodation options nearby include Holiday Inn Express Hotel & Suites Airport Dieppe and Fairfield Inn & Suites Moncton. Are there hotels in other cities near Kouchibouguac? 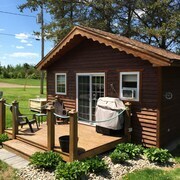 What other types of accommodations are available in Kouchibouguac? Explore Kouchibouguac with Expedia.ca’s Travel Guides to find the best flights, cars, holiday packages and more!